The Fellowship was fortunate enough to obtain a copy of FRANKENSTEIN ALIVE, ALIVE! #1 from IDW Publishing. Steve Niles writes, and Bernie Wrightson is the artist. 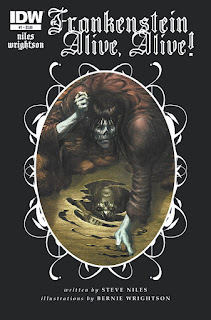 This book marks Bernie Wrightson’s triumphant return to the story of Frankenstein. This time he and Steve Niles are continuing the story from the point of view of the monster, showing his attempt at a normal life ‘after the end’ as well as his recollections of that end. We see a glimpse of his life now, and then he begins to tell us the tale of how he got here and what was going through his mind before. Mrs. Shelley’s book has always been one of my favorites, so I’m intrigued by this issue. These gentlemen have put together a tantalizing introduction to a story that the original novel could only hint at. 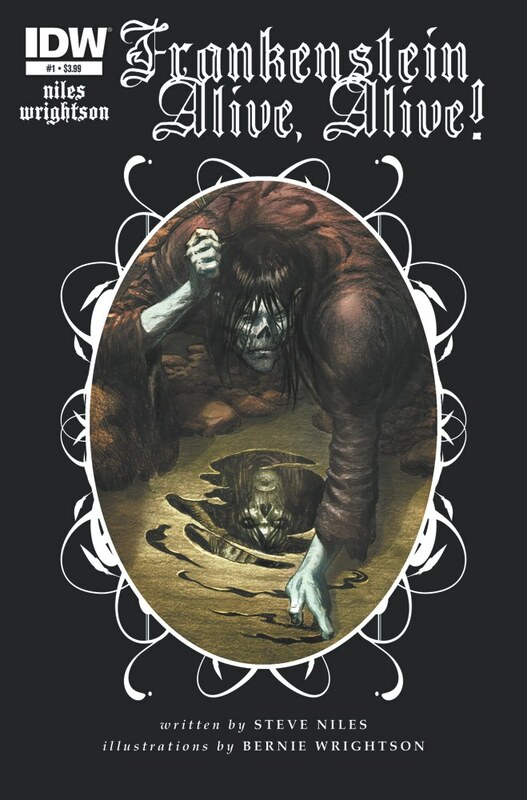 The novel does have the monster telling Victor some of what passed early in his ‘life’, but here we have a chance to see that expanded upon, and also to see what could have become of the monster after the novel. Very big potential here. And the art is downright beautiful; very much in line with the Gothic style of the novel. Oh, and don’t skip over the interview at the end, especially if you know anything about the film history of the character. I really like this book (this seems redundant now J ). FRANKENSTEIN ALIVE, ALIVE! #1 is available now at your FLCS or by order from idwpublishing.com.